Overton is an Unincorporated Town located in Clark County, Nevada. Start off your visit on the 17th (Mon): tee off at Wolf Creek Golf Club. 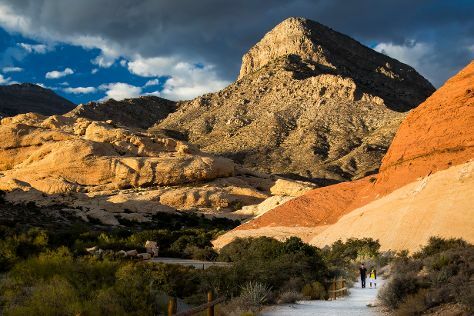 Get ready for a full day of sightseeing on the 18th (Tue): immerse yourself in nature at Valley of Fire State Park and then tour the pleasant surroundings at White Domes Trail. Discover how to plan a Overton trip in just a few steps with Inspirock's itinerary builder. Los Angeles to Overton is an approximately 4-hour combination of flight and car. You can also do a combination of flight and car; or drive. Traveling from Los Angeles in June, expect nights in Overton to be somewhat warmer, around 76°F, while days are much hotter, around 102°F. Finish your sightseeing early on the 18th (Tue) to allow enough time to drive to Las Vegas. Take a break from Las Vegas with a short trip to Hoover Dam in Boulder City, about 50 minutes away. The adventure continues: take in breathtaking views at Red Rock Canyon National Conservation Area, take in nature's colorful creations at Bellagio Conservatory & Botanical Gardens, admire the local landmark of Bellagio Fountains, and take an unforgettable tour with a helicopter tour. To find reviews, where to stay, and other tourist information, read our Las Vegas trip itinerary tool . Drive from Overton to Las Vegas in 1.5 hours. June in Las Vegas sees daily highs of 103°F and lows of 77°F at night. Finish up your sightseeing early on the 28th (Fri) so you can travel back home.